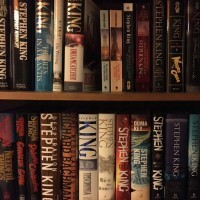 If asked to compile a list of my favorite stories of all time, I would probably fill half of it with novels and short stories by Stephen King. To dub King a horror writer, which is always popular, is to do his stories an injustice. I love horror stories, but there is so much more going on here. To my mind, above all, King writes about people. Real people; not the shimmering, handsome role models of a Koontz novel, nor the hastily sketched caricatures of a Barker book. People who breathe, think and feel. What better way to get to know these people but to put them in an extreme situation, be it supernatural, horrifying, awe-inspiring or all of these? Not throw them into it while remaining on the outside, regarding them from a cool distance, but follow them all the way through the dark and, maybe, back into the light again. Describe the events in words that create vivid images and clear sounds, that ceases to be mere words, actually. Describe it so that if something unbelievable should happen, you have no choice but to believe it. But hey, I sound as if he is just a different sort of psychologist. Let’s not forget, he’s also damn entertaining.